Many persons who see the title of this article would quickly assume that the article is about the two main contending parties in Nigeria—the PDP and the APC. I am too happy to burst many persons’ bubbles. This article is not about the campaign slogan of any political party. Rather, it is about the glaring culture of the Nigerian people. Ask any Nigerian what the country’s problems are. The average Nigerian would point at the politicians as the major problem with the country. “The politicians are very corrupt”. “All the politicians think about is themselves”. “If the politicians can change, this country would be better”. These views illustrate the deep-seated psyche of many Nigerians to blame others, never accepting responsibility for any problem. The mentality is to wait for someone else to fix problems, instead of thinking and executing solutions. In fairness to many Nigerians, their view that the politicians constitute the country’s major problem is true to some extent. Leadership has been proven to be a vital factor in determining the direction of any organization or society. Good leaders motivate their followers and rally them around a cause for the common good and development of the organization. Hence, some Nigerians would prefer to cite bad leadership (by politicians) as the problem. However, in trying to shift all responsibility to the politicians, many Nigerians have tactfully ignored the role played by followers in any organization. Some followers become leaders. Thus, repeated instances of bad leadership highlight a serious problem with the followership. It is a case of the chicken and the egg. Is bad leadership responsible for followership? On the other hand, is bad followership responsible for bad leadership? I think both statements are correct—a self-propelling cycle. 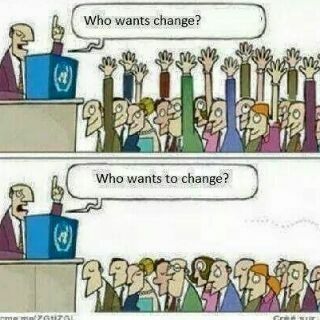 Nigerians chanting “change” must be ready for all-round change. As we push for a change in leadership, we should also push for a change in followership. Bad followership would frustrate even the most good-intentioned leader because development is a team effort. If the head wants to move from point A to point B, but the legs refuse to move, the head’s thinking is meaningless. How many Nigerians are ready to internalize the change? How many are ready to change their lifestyles and driving philosophies? How many are ready for a change of both the wineskin and the wine? How many are ready to accept that they are responsible for some of Nigeria’s problems? How many are willing to change their definition of “bad”, and clearly see that the tag, “bad”, could also apply to them? If we cite corruption as the biggest impediment to Nigeria’s development, we must recognize that the evil bug has eaten deep into the nation’s fabric. The average Nigerian is as corrupt as the politician at the top is. Just give that average Nigerian a little chance to control public funds. In a sad case of hypocrisy, corruption is seen as stealing “huge” public funds. Smaller funds are cited as “being smart”. Someone sent to buy an item for an organization would instruct the salesperson to issue a fake receipt (larger sum). Yet, that is not viewed as corruption because it does not involve public funds. The parent, who does not see paying for examination answers for a student as corruption, needs to change. Those who see nothing wrong in driving without correct documents nor safety devices, and bribing police officers for their misdemeanour need to change. Those who reach the office by 9:15 am and write 7:51 am in the attendance register need to change. Those who jump queues need to change. I could go on listing many every day occurrences in Nigeria that are symptoms of the communicable malaise called corruption. The sad bit is that many Nigerians who say they want a change in leadership would prefer continuity for their own egregious lifestyles. This is hypocrisy at its very best—whitened graves harbouring putrefying decay inside. We want better roads, but we are not ready to drive safely on them, with proper documents. We want jobs, but we are not ready to diligently put in our best. We want an improved educational system, but we would not inspire our children to study hard. We want orderliness, yet, queue jumping is our watchword. Nigeria cannot move forward without all-round change in every sphere of life. Except we want continuity of our problems, we must be ready for change. If we want change in Nigeria, you and I must change. You and I are the people. You and I are the politicians. You and I can change Nigeria.